Tasks Live is a filter-import-and-export-joins-gmail-labs-enjoy-the-new-experience/">new feature for Google Calendar, which has been a notice a while ago. It is very easy to use, just click on the link “Tasks” in the left hand and to the right side a how-to-enable-sender-time-zone-in-gmail/">widget will appear. 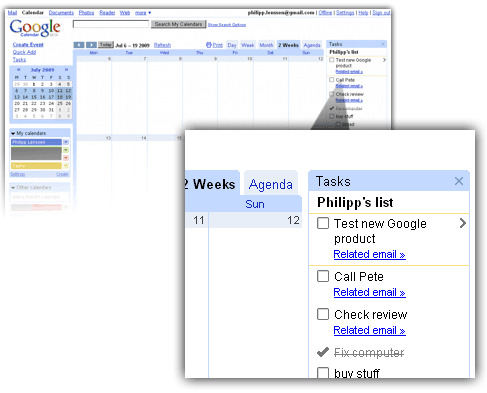 This widget has the facility to share the data and its behavior with the Tasks feature we can google-brings-color-selector-to-search-by-color/">choose it for the Gmail Labs. google-offers-free-offline-calendar-for-all/">want to know the free calendar from Google for all ? Moreover sort-tables-in-google-docs-easily/">adding new tasks is so simple as typing at a new position within the gadget then other features can be added by clicking the greater than symbol “>” icon to the right side. If we want to you-can-never-forget-your-friends-birthday-in-orkut/">delete the task, we can do it by simply hitting the backspace key.